Sadboy Teardrops Salt - Shamrock Cookie 30mLAvailable in 28mg and 48mg nicotine strengths in 30mL bo..
Sadboy Shamrock Cookie 100mLAvailable in 0mg, 3mg, and 6mg nicotine strengths in 100mL bottles..
Sadboy Teardrops Salt - Unicorn Tears 30mL*Mystery Flavor*Perfect harmony of fruity yet savory. This..
Sadboy Unicorn Tears 100mL*Mystery Flavor*Perfect harmony of fruity yet savory. 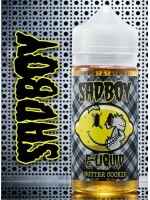 This sweet and..
Sadboy Teardrops Salt - Custard Cookie 30mLAvailable in 28mg and 48mg nicotine strengths in 30mL bot..
Sadboy Teardrops Salt - Pumpkin Cookie 30mLAvailable in 28mg and 48mg nicotine strengths in 30mL bot..
Sadboy Teardrops Salt - Straw Jam Cookie 30mLAvailable in 28mg and 48mg nicotine strengths in 30mL b..
Sadboy Teardrops Salt - Key Lime Cookie 30mLAvailable in 28mg and 48mg nicotine strengths in 30mL bo..
Sadboy Teardrops Salt - Butter Cookie 30mLAvailable in 28mg and 48mg nicotine strengths in 30mL bott..
Sadboy Teardrops Salt - Blue Jam Cookie 30mLAvailable in 28mg and 48mg nicotine strengths in 30mL bo..
Sadboy Strawberry Jam Cookie 100mLAvailable in 0mg, 3mg, and 6mg nicotine strengths in 100mL bottles..